Review Opti-Free RepleniSH Flight Pack I have been using this product for years and am very satisfied with it, it is excellent. Review Opti-Free RepleniSH Flight Pack Didn’t like it as much as my usual solution. Review Opti-Free RepleniSH Flight Pack Very handy for when space and weight of luggage is important. Review Opti-Free RepleniSH Flight Pack This is my favourite one, lasts for long time. Review Opti-Free RepleniSH Flight Pack Really good. Always use it for holidays , short breaks and trips away from home. Review Opti-Free RepleniSH Flight Pack Great product for travelers! But a little bit expensive! Review Opti-Free RepleniSH Flight Pack Good size for up to 2 week holiday. Saves taking a big bottle. Review Opti-Free RepleniSH Flight Pack Handy travel pack of the best solution on the market. Opti-Free Might favourite solution in a useful travel sized pack, couldn't ask for more - just what i needed for my upcoming holiday! Opti-Free RepleniSH Flight Pack Excellent quality and size. Easy to use and doesn't spill over easily. Opti-Free RepleniSH Flight Pack Very convenient for when you are on the go! 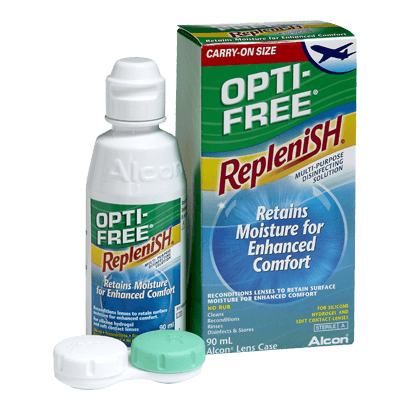 The Opti-Free RepleniSH Flight Pack from Alcon includes a handy, travel sized version of the manufacturer's highly effective cleaning solution. Making great use of the advanced TearGlyde technique, this great solution will keep your lenses clean and moist throughout the day. Opti-Free RepleniSH is especially effective for very soft, advanced lenses, which may start to collect proteins and dirt just through day to day use. The solution gently washes the lens, dramatically reducing the chance of irritation from the lens. TearGlyde technology is used to lock a tiny layer moisture onto the surface of the lens. This ensures they stay comfortable, even in air-conditioned offices or while travelling on the plane. Includes a handy 90ml bottle of cleaning solution as well as the added bonus of a secure contact lens case, which has been specially designed for bathing lenses thoroughly.